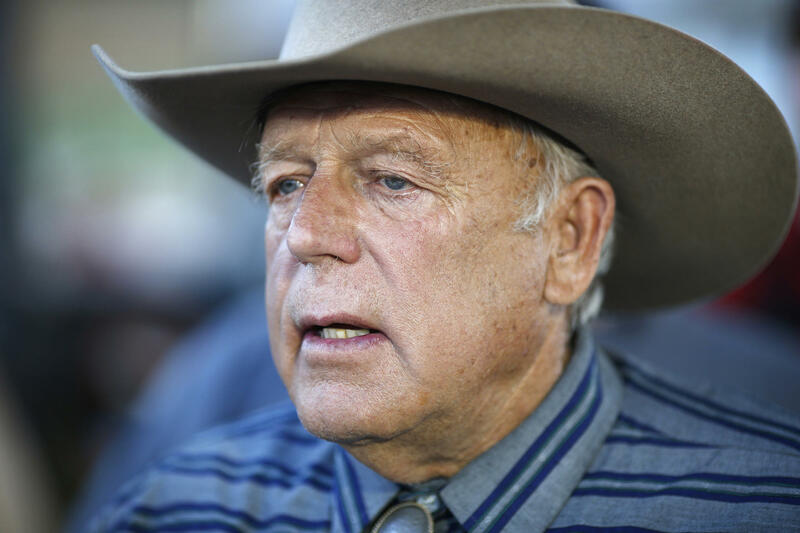 In this April 11, 2015, file photo, Nevada rancher Cliven Bundy speaks with supporters at an event in Bunkerville, Nev. Bundy has filed a lawsuit accusing Nevada Democratic congressional candidate Ruben Kihuen of defamation with a campaign mailer that Bundy says blames him for the ambush deaths of two Las Vegas police officers in 2014. Federal prosecutors want a judge in Nevada to schedule a trio of trials for the 17 defendants jailed on charges stemming from an armed confrontation in April 2014 with U.S. officials over grazing rights near cattleman Cliven Bundy's ranch. But Bundy and his attorney call in documents filed Wednesday for all the defendants to be tried together. Otherwise, the defendants who are required to wait will spend more months behind bars without a chance to prove their innocence, Bundy attorney Bret Whipple said in the request to Chief U.S. District Judge Gloria Navarro. All 17 defendants have pleaded not guilty to charges that could get them decades in federal prison. They and two others who have pleaded guilty in the case remain in federal custody in southern Nevada. The judge plans a Dec. 9 date-setting hearing in the case stemming from allegations the men conspired to create an armed posse to prevent federal agents and contract cowboys from rounding up Bundy cattle that the U.S. Bureau of Land Management said were trespassing on public land. Navarro has denied bids by Bundy and other defendants to be tried individually. She called it "logistically impossible to try all 17 defendants in a single trial." Federal prosecutors filed paperwork Nov. 13 proposing three trials, grouped according to whether the defendants were alleged leaders, mid-level organizers or "follower-gunmen" during the standoff outside Bunkerville. The first trial would start Feb. 6 for the accused conspiracy leaders: Bundy, his sons Ammon and Ryan Bundy, and co-defendants Ryan Payne and Peter Santilli. Each faces 16 felony charges, also including assault on a federal officer, extortion and obstruction of justice. A second trial would start in May for six alleged "mid-level leaders and organizers" of the standoff: Bundy sons Dave and Mel Bundy, Brian Cavalier, Micah McGuire, Joseph O'Shaughnessy and Jason Woods. A third trial would begin in August for six accused Bundy followers and gunmen: Gregory Burleson, O. Scott Drexler, Todd Engel, Ricky Lovelien, Eric Parker and Steven Stewart. Ammon and Ryan Bundy were returned to Las Vegas last month after they and five other defendants were acquitted by a federal court jury in Portland, Oregon, of all charges relating to an occupation of a national wildlife refuge in eastern Oregon.